of the Florida Keys were no longer recognizable. Bonita Springs ... Immokalee ... Everglades City ... Arcadia ... LaBelle ... these towns so close to ours were some of the hardest hit. Many lost everything, power was out for days and confusion and miscommunication among some of the bigger disaster relief providers slowed down the process for people who needed help. Stores throughout Florida were closed for days in some cases, even in areas not hit as hard. There was no gas, there was little bottled water. Many grocery store shelves were empty, and the food didn’t come back with true reliability for almost two weeks (many of us still breathe a sigh of relief to see loaves of bread on the shelves, even more of us feel a twinge of desperation when we see we’re down to 1/4 of a tank in our cars). Those who had a roof over their head but were without water, power and electricity flushed toilets with water from the bathtub, shared their supplies of food and batteries with each other and were generous with their cell phone chargers. Here on Gasparilla Island, though, things are often different and this storm was no exception: The infrastructure of people who hold this “spit of sandy land” together is undeniably strong. In a big town people see a tree down across the road and stand and stare, but in a little town everyone grabs a chain saw and starts cutting. At daybreak on Monday, Sept. 11 people were starting to find ways to get back to the island and get to work. The sounds of chain saws and generators filled the air. Everyone from the firefighters to Joe Wier at the Boca Grande Community Center congregated before the wind even completely died down, and they got to work. Local excavating company owner Kevin Kelley has handled more than a few storm clean-ups in his time on the island. His equipment was running before the rain stopped and he was one of the very first people to see and start cleaning up the damage after the storm. Downed lines were called in and marked as safety hazards, firefighters and sheriff ’s deputies went door to door to make sure the people who stayed were all right. People slowly started coming out from their homes to witness the fact our island was, in fact, still standing. We weren’t without damage, though. Some of the worst of it took place at the south end, particularly at Gasparilla Island State Park. The Amory Chapel looked like a little cabin in the Minnesota woods after a deep snowfall, but water and sand made their way into the building as well. Ankle-deep, it left its mark on the walls and floors that had just been redone. 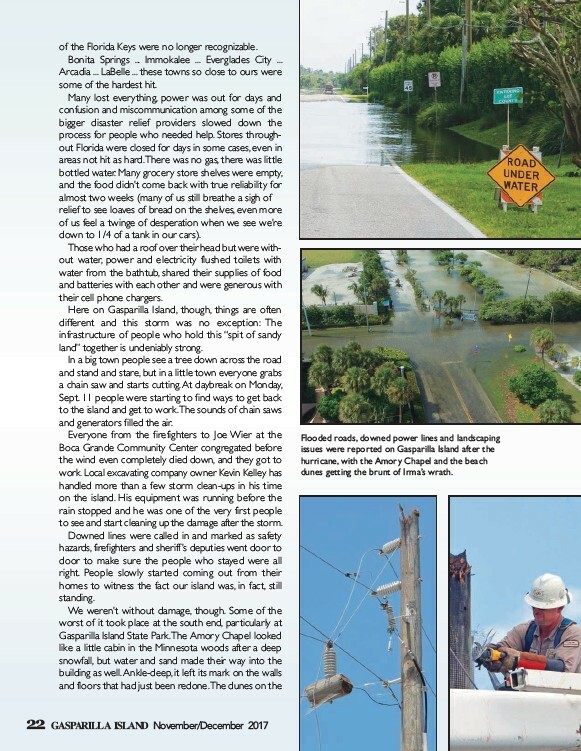 The dunes on the 22 GASPARILLA ISLAND November/December 2017 Flooded roads, downed power lines and landscaping issues were reported on Gasparilla Island after the hurricane, with the Amory Chapel and the beach dunes getting the brunt of Irma’s wrath.